In 2011, the Centers for Disease Control and Prevention (CDC) released the results of an investigation into which room in the home is the location of most slip and fall injuries. The study found that the bathroom is the most dangerous place in the average home and tub safety became a priority. American Standard offers walk-in tubs in a variety of models that can be customized to fit the space in your bathroom. Depending on the model, prices range from around $4,700 to over $11,000. American Standard has a large variety of walk-in tubs. Each model includes optional features such as LED lighting, built-in grab bars, massage jets and more. If you're in the market for a walk-in tub, check out or picks for the best walk-in tub companies. The accessibility of walk-in bathtubs helps make bathing safer and easier for people of all ages. Seniors in particular greatly benefit by never having to climb into or out of a wet and slippery tub, risking a fall. There are several models of American Standard walk-in tubs with optional spa-like features that take them beyond an easy-to-open door and compliance with Americans with Disabilities Act (ADA). American Standard, the brand we named as offering the Best Luxury Massage Tub, has been a recognized and respected name in bathroom and kitchen fixtures for over 140 years. Their tradition of quality and innovation has put them in three out of five homes in the U.S. as well as in thousands of businesses, hotels, airports, and stadiums. Today, American Standard offers a wide variety of walk-in tubs with many choices of door and installation configurations. Several of their tubs are available with hydrotherapy options that can add a whirlpool or air bath feature, creating a functional and safe tub that gives a spa-like experience using massaging water jets or air bubbles. Chromatherapy, a type of light therapy, is also offered in many of American Standard walk-in tubs. American Standard sells their walk-in tubs directly and at most major home improvement retailers such as Lowes and Home Depot. You can view their extensive list of walk-in tub models, features, colors, prices and more on their website. Here’s a snapshot of their price ranges based on the type of walk-in tub. If you purchase directly from American Standard, the cost includes installation. If you buy one of their tubs from a third party vendor, the cost of installation is separate, and pricing varies from what we listed below. American Standard offers over 100 different walk-in tubs in the colors biscuit, linen and white. Nearly all of their products have built-in grab bars as a standard feature, and 83 percent come with the exclusive Quick Drain system, draining the tub in two minutes or less. American Standard walk-in tubs are broken down by type: Walk-in air baths, deep soaking tubs, combo massage tubs and walk-in whirlpool tubs. Walk-in Air Baths: These walk-in tubs feature a massage-like sensation due to thousands of tiny air bubbles. You can adjust the massage strength to your personal preference. Deep Soaking Tubs: Deep soaking tubs are, as the name suggests, designed for long soaking baths. The seat is wide and slightly reclined. Walk-in Whirlpool Tubs: Whirlpool walk-in tubs use jetted streams of water to create a massage effect. Water jet strength can be adjusted to personal preference. Combo Massage Tubs: The combo massage walk-in tubs combined the air spa features and the whirlpool features in one tub. You can filter your search by feature on American Standard’s website when shopping online for walk-in tubs. The warranty for American Standard premium acrylic walk-in tubs comes with a 15-year warranty on the bathtub, 10-year warranty on the tub components and a lifetime warranty on the door seal. American Standard walk-in tubs with high gloss acrylic gelcoat construction come with a 10-year warranty on the bathtub, five-year warranty on the tub components and a lifetime warranty on the door seal. The warranty for the Liberation model of walk-in tubs includes fixtures, parts, labor and installation for life. What is American Standard’s most popular walk-in tub? The most popular walk-in tub sold by American Standard is the Gelcoat Value Series 30×52-inch Outward Opening Door Soaking Walk-In Bathtub – Right Door and Drain. With an MSRP of $5,548, the tub comes in two finishes: white or linen. It features a deep soaking tub basin with a built-in chair for a safe and relaxing bath as well as an outward opening door, a built-in safety bar and a textured floor to keep bathing safe. This model includes a premium fast-fill tub faucet, handheld showering wand, polished chrome trim, and fits in standard sized bathrooms and smaller spaces. If you have a larger space, a tub extender kit is included to allow the tub to fill a 60-inch space. Does American Standard have any special offers? American Standard offers special pricing from time to time. A recent promotion offered $1,500 in savings for every customer who purchased and installed a new Liberation walk-in tub with installation. What should I expect during the free in-home evaluation? An American Standard Professional Bathroom Safety Specialist will take the time to explain all the features and benefits of their walk-in tubs. The specialist will then perform a complete safety assessment, take measurements, and explain the installation process. Finally, they will talk to you about financing and give you a firm estimate based on the options you’ve chosen and the scope of the work. What is American Standard’s installation process? Licensed and certified installers will professionally remove your old tub and install your new walk-in tub. When the installation is complete, the installers will test the tub to be sure everything is working correctly. They will also show you how to use each feature of your new walk-in tub. What makes American Standard’s Quick Drain system so unique? Most walk-in tubs take between six and 15 minutes to drain, causing the bather to get chilled while they wait to exit the tub. The Quick Drain system drains water in two minutes or less, reducing the risk of getting chilled. 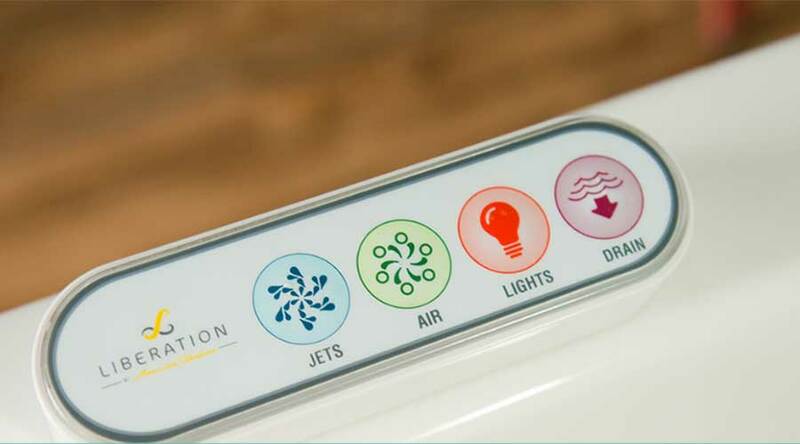 How many jets does the Liberation by American Standard have? 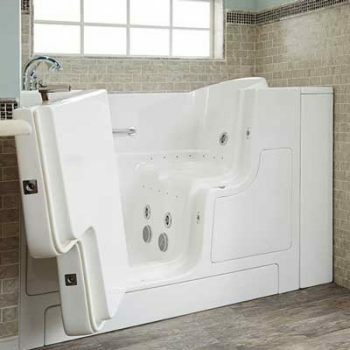 The American Standard Liberation Series walk-in tub features the RevitaJet systems with 44 air and water jets, more than you will find in other walk-in tubs. Their easy-to-use touchpad gives you total control over your bathing experience. How much water does a standard walk-in tub hold? On average, a walk-in tub holds between 50 and 55 gallons of water. 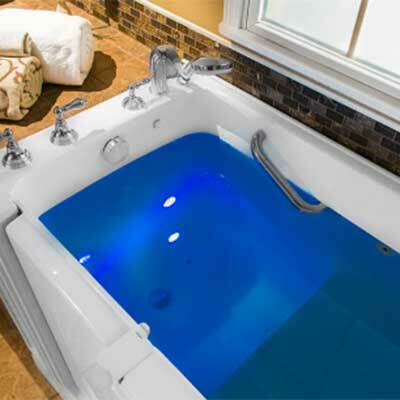 While this is more than a standard tub, it is on par with a shower which uses about seven gallons per minute. If you’re considering a walk-in tub, you’ll want to make sure that your water heater is large enough to be up to the task. Does Medicare cover walk-in tubs? As of May 2018, no. Walk-in bathtubs are not covered by Medicare because they are not considered to be durable medical equipment. What are the advantages of walk-in tubs? Walk-in tubs are an excellent choice for seniors who have mobility restrictions. Built-in features like handrails, seats and textured floors meet your safety needs. Jets, LED lighting and aromatherapy can turn a bath into a spa experience that washes away the aches and pains. What are the disadvantages of walk-in tubs? Unlike a regular tub, you need to fill a walk-in tub with water after entering it. You will not only have to wait for the water to get to the right level, but you could also have difficulty adjusting the temperature to your comfort. Walk-in tubs are more costly than regular bathtubs, and they often require professional installation. Beyond the relevant safety factors, walk-in tubs from American Standard offer much that the competition does not. With so many models and options to choose from, finding just the right tub for your needs is easy. The American Standard name and history are another plus as they have a long reputation for high-quality products. The warranty on the Liberation models is unmatched by other manufacturers, and their prices are competitive. I signed up for the Liberation walk-in tub/shower combo, based on the company’s well-known name. The salesman gave a great PowerPoint presentation; problem was the product didn’t live up to the hype. The tub was too small. After 2 more unsuccessful attempts to find a product that would actually meet our needs, I cancelled the contract. Yes it was after the recision period, but I wouldn’t have cancelled if the company had delivered what they promised. I’ve been waiting for my refund since last November. All of their Customer Service people kept promising that the refund was in process and it would take 4-6 weeks. However I found out today that the refund request was JUST processed on Jan 7th, and that it will be another 4-6 weeks. I’ll never consider American Standard for any major purchase ever again. Well the installer fell through our garage ceiling hitting our garage door opener... it is being replaced today $717.00. The installer needed pictures and asked if we did this and that, its a brand new home!!! Why would he have not told me he tore up our garage door opener!!! So ticked! Needless to say having to buy a new garage door opener... I wish I would have never hired this company!! Upset sister of hanicap 60 yr old F.
I had an American Standard walk in tub installed recently, costing about $7000 just for the tub. My hands are arthritic and I am not able to use the lever to lock the door. It requires too much strength. Also I used it with the help of my daughter locking the tub and it took a very long time to fill. I was running out of hot water before it filled. I turned on the air and jets which worked for a few minutes and shut off. I cannot get those working again. I am likely going to have my builder remove the tub. Very disappointing waste of money. It does drain quickly. My experience with AMERICAN standard services in regard to their Life Time Warranty in regard to the liberation walk-in-tub has been very disappointing. When it worked it was as advertised, fantastic... but if it breaks down... then YOU will have problems. My tub has stopped working 4 times in less than 9 months of purchase. Customer service representatives Alexas and Kim have tried bypassing my concerns up the ladder but that ladder must be broken. The reps have even expressed mailed me the electrical parts to my home I received ln July. I even called “Rick” the technician who installed and got my liberation tub temporarily working the 3 other times it stopped working. I even call “Rick” this 4th malfunction several times... no return call from many messages left on his phone by me and customer service representatives. Apparently “Rick” is the only certified and not afraid to work on the liberation tub. Also in my four bathroom home I have a JACUZZI regular tub with jets that I have had for 14 years no problems. The JACUZZI COLLECTION now have walk-in-rubs and 24 dedicated technicians to provide service... but I chose an AMERICAN standard product... the name should speak for itself... SAD. I have no complaints; all went well with the installation even though it rained before, during, and after the installation. The men cleaned up everything. No mud got on my carpet. In the mud etc. the instructions were lost and I need them in order to control the hot and cold water. So would you please send me the instructions. My husband and I have been looking at walk in tub for a while. There is so much out there on the internet but speaking to a "non pushy salesperson" was difficult to come by. We found the companies that came for an in-home visit wanted us to make a decision right away and they kept offering discounts to decide right then. We never purchase anything that way so we searched a around on the internet and found a company Theratub their website is **. We reached out to their representative and they were polite and provided a quotation right away with no games. The price was under $10,000 for all the bells and whistles on the tub. This has been one of the best purchases and I would recommend a walk in tub for anyone that is planning on aging in their home. Luckily I read Ivan O’s review in time submitted two weeks ago. I live out of town and wanted to help my 90 year old father get a walk in tub quote since he is struggling with his current tub to take a shower or bath. I called 9-4-18 and talked to a rep to schedule someone to come out while I was here visiting. To my surprise they said they could have someone here 9-5-18 at 1:00. Not even 10 minutes later I had some call to confirm the appointment, address, time, telephone number for the quote. Again quite impressive. That’s where it ends. Although we had some errands to do we made it home by 12:30 and waited until 2 pm... no one showed. I called the number they told me to if I had a problem. After explaining my situation they put me on hold for 5 minutes, came back on and apologized saying that person cancelled (no one notified us). She then said a manager would get back with me in 5 minutes or less... still waiting at 4pm. As Ivan ‘s review said and I concur, absolutely no sense of urgency. Glad I caught it before we committed to them installing a tub for us!! SAD!! I helped my mother get her Liberation walk-in-tub on 10-10-15 and she paid $15,110.31, that she paid with a check out of her savings. The installer had to take her door frame apart to get the tub in and had told me he had done many, many of these and would put everything back to where you could not tell it had been altered. When he was done and gone there were over 50 nails put in the same three boards that were used to re-frame the doorway, one was split but they used it anyway. I had been asked to stay away because I was making the installers nervous, so I did not see the mess until they had left. They never even cleaned up the mess they made, that was left for my 89 year old mother to take care of. I called to complain of the lack of professional work and was told that my mother had left a great review. When asked, she said when she tried to complain about the work, the interviewer hung up on her. Now on 8-03-18 the tub has a leak and I started calling on 8-04-18 @ 9:45AM Pacific Time, 11:23AM 8-04-18 Pacific Time, no response. I called again 8-06-18, 9:15AM Pacific Time talked to Alexas, I told her that this was my mothers only bathroom and bathtub. i was told a installer would return my call, I got no response. Called again on 8-08-18 12:52PM talked to Alexas again was given installer Grady's phone #called him 1:09PM no return call. Called again on 8-10-18, 1:50PM talked to Kim who transferred me to Jackelyn who transferred me to Alexas who offered me the installers phone # I said I had already called the installer and left a message & got no Response. She said she would have his supervisor call me back, that never happened. Called again 8-14-18 , 8:00 AM on Kims personal # was told that she would have new installer call me, that never happened either . 8-15-18 Finally gave-up and called American Standard Corporate Office , talked to [email protected] 10:50 AM Pacific Time ,I told her that this was my 89year old mothers only bath tub and she had recently fallen and broke her back, so she desperately needed her tub! And I was told that someone in customer service would call me back, it is now 11:30AM and still not one person from this blessed company has called me back to schedule to fix my 89 year old mothers tub. I guess this should teach people not to pay cash for one of these, because then you have no leverage to get them to honor their lifetime warranty. They should only be paid for on credit or on a contract so if there is a problem with one a person could stop payment until they come out and fix it, because it looks like they will not fix it on their own good reputation! This whole thing is really sad that they would take advantage of a senior citizen like this!